The blueberry epidemic began to sweep the nation in the early 20th century from a simple pique of interest. Nowadays, the fruit is used for many culinary and medicinal purposes. In the early 1900's, the daughter of a cranberry farmer teamed up with a botanist after she found out he was searching for an ideal wild plant for breeding. This began the subsequent blueberry epidemic that has swept North America. Since then, studies have continued to uncover this fruit's health benefits on and off the table. Improving eye health. Blueberries can enhance ocular health, helping prevent glaucoma and cataracts, and have also been shown to be effective for treating corneal ulcers. Fighting against infections. Blueberries help inhibit the growth of bacteria along the lining of the inner walls of the urinary tract, thus preventing UTIs. Stimulating bowel movements. The high amount of dietary fiber in blueberries gives them laxative properties that help regulate gastrointestinal functions. 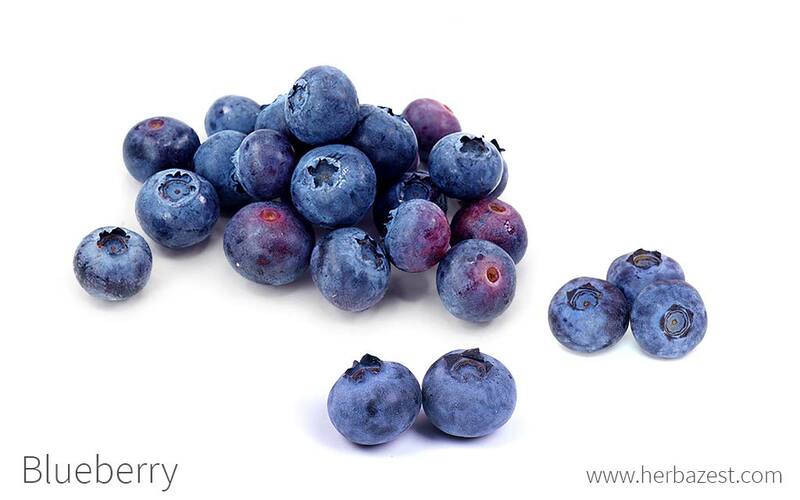 Blueberries are also used as anti-aging remedies due to the high number of antioxidants present within these fruits. 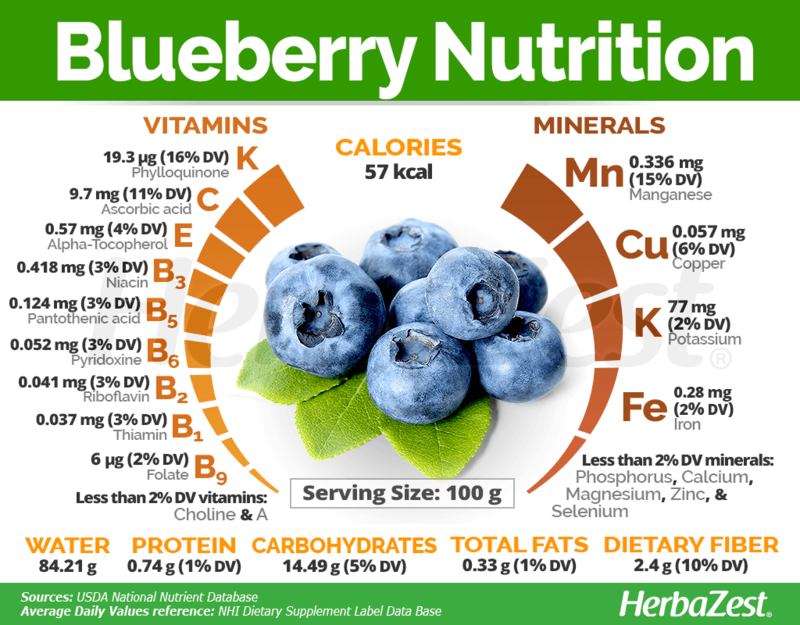 There are many compounds within blueberries that contribute to improving the body's overall health. Blueberries are one of the highest-ranked fruits for antioxidants due to the presence of a type of flavonoids called anthocyanins, which are also responsible for the fruit's dark blue color. 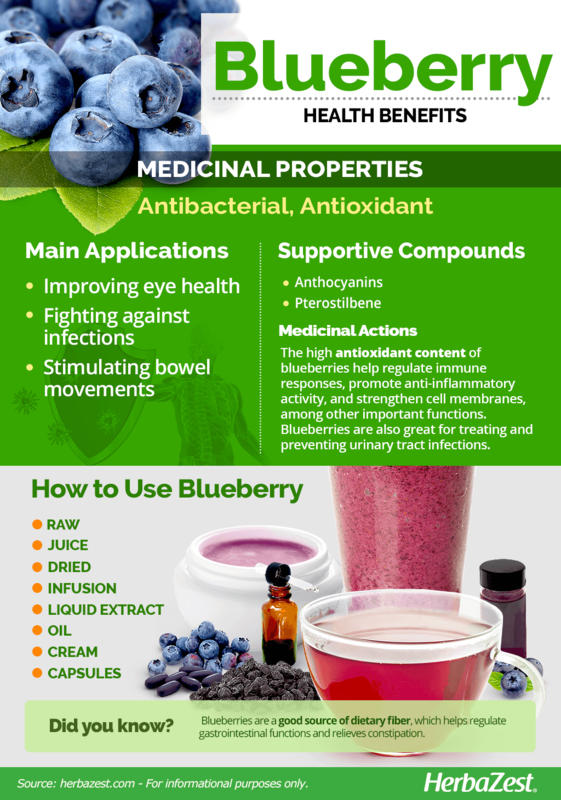 The high antioxidant content of blueberries contributes many health benefits, such as boosting the production of cytokines, which are small proteins that interact with other cells and help regulate immune responses, promote anti-inflammatory activity, and strengthen cell membranes, among other important functions. Blueberries are great for treating and preventing urinary tract infections. Though its clinical effects on UTIs have not been fully investigated, its antioxidant compounds have been found to have an antibacterial action, blocking the adhesion of E. coli to the walls of the urinary tract. 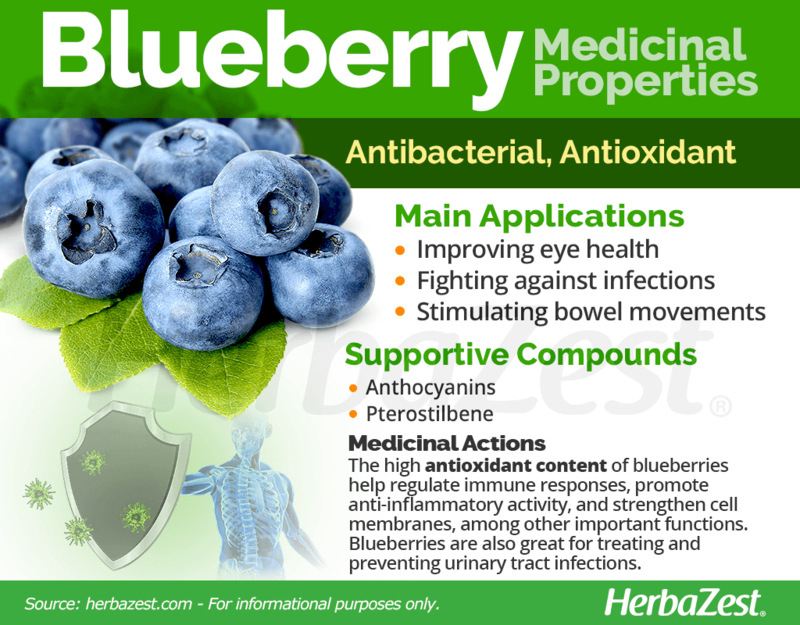 Moreover, pterostilbene, another antioxidant compound contained in blueberries, has been shown to be just as effective in lowering cholesterol as commercial drugs. BLUEBERRIES ARE ONE OF THE HIGHEST-RANKED FRUITS FOR ANTIOXIDANTS. Cleavers, myrtle, and neem also possess antibacterial properties, while acai, camu camu, and carrot can be used as alternative sources for antioxidant benefits as well. It is safe to consume antioxidant-rich fruits such as blueberries in recommended amounts. With a balanced diet that includes five daily servings of fruits and vegetables, intoxication through food is more difficult to achieve than it is through supplements. However, consuming blueberries in excess can cause stress in the body and negatively affect its capacity to detoxify or repair itself. OVERCONSUMPTION OF ANTIOXIDANTS SUPPRESSES BODY'S ABILITY TO FUNCTION PROPERLY. Women who are pregnant or breastfeeding should only eat recommended amounts of any food high in antioxidants, such as blueberries. Since blueberries may lower blood sugar levels, diabetics taking medications and those who need a consistent blood sugar level before certain medical procedures should reduce their consumption of these fruits. It is recommended for patients to stop consuming blueberry products at least two weeks before a scheduled surgery. On the nutritional side, blueberries are a good source of vitamin K (phylloquinone), which is necessary for proper coagulation, as well as for improving bone health, thus reducing the risk of fractures. Manganese,on the other hand, is an essential mineral that helps in the breakdown of carbohydrates, the absorption of calcium, and the regulation of bloodsugar, whereas vitamin C (ascorbic acid) promotes immunity, stimulates the formation of collagen, and contributes to plant-based iron absorption. Additionally, the copper in blueberries plays an important role in the production of red blood cells, as well as in the well-functioning of blood vessels, bones, nerves, and immune system. Blueberries also contain very small amounts of many other nutrients,such as calcium, iron, magnesium, phosphorus, potassium, zinc, B-complex vitamins, choline, and vitamin E.
100 grams of blueberries provide 57 calories and 10% of the daily value for dietary fiber. The most effective way of obtaining the health benefits from blueberries is by eating them raw due to their high vitamin and mineral content. However, for medicinal purposes, the properties of blueberries can be taken in concentrated forms, in a variety of preparations. Raw. Eating them raw offers consumers high amounts of fiber, vitamins, and minerals. Dried. Both dried blueberry fruit and dried blueberry leaves share astringent properties and are used to treat diarrhea. Juice. Juice has been added to many cosmetic products to rejuvenate the skin thanks to the fruit's antioxidant benefits. Infusion. Blueberry tea is often made from the leaves and is used to alleviate sore throats and swelling or inflammation of the mouth. The antioxidant benefits of blueberries can also be obtained from the frozen berries, as well as from preserves, such as syrups, jams, and marmalades. Liquid extract. 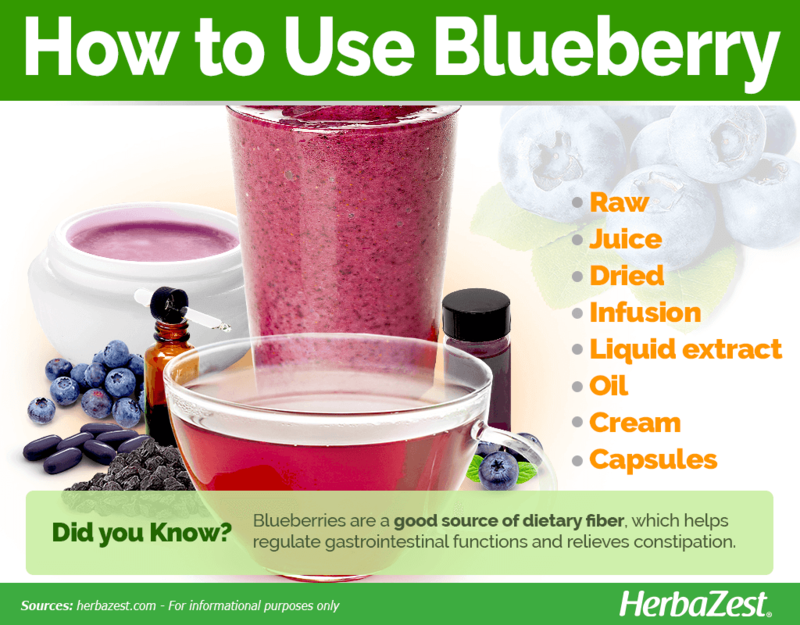 An extract made from blueberry leaves is believed to aid in reducing blood sugar levels. Oil.Blueberry seed oil carries the antioxidant action of the fresh blueberries, and it is considered a great soothing and anti-aging preparation for the skin. Cream. Various forms of blueberries have been added to cosmetics, skin care ointments, and facial creams for anti-aging benefits. Capsules. This supplemental form of blueberry comes in standardized doses. Blueberry pills are thought to lower blood pressure, fight against inflammation, and reduce cholesterol levels. In-season, fresh blueberries in North America are widely available during the summer months, through August or September. South American blueberries are imported the rest of the year. All blueberries are simple to purchase in most grocery stores and supermarkets, as well as farmers' markets during the summertime. Frozen blueberries, juices, teas, and other blueberry products can be found year round in the same stores or for online purchase. MANY SOUTH AMERICAN COUNTRIES EXPORT BLUEBERRIES TO NORTH AMERICA DURING THE WINTER MONTHS, MAKING FRESH BLUEBERRIES AVAILABLE YEAR ROUND. Growing blueberry shrubs requires very specific conditions. They grow best in acidic soils and with full sun, sometimes partial shade. However, full sun translates into more blooms and, consequently, more fruit. Blueberry shrubs are often found growing in or near swampy areas, as they require a lot of water. In order to thrive, blueberries require cool weather. They are able to withstand temperatures of -5 to -13°F (-20 to -25°C ) without damage. Blueberries grow best in acidic soil (pH levels of 4.0 - 5.0) that is loose, well-drained, and high in organic matter. The best time to plant blueberries in North America is in late April or early May, and harvest falls from late July to mid-August. For standard shrubs, space blueberries at least three feet (1 m) apart from each other, depending on the specific cultivar. Blueberry plants grow slowly. It takes 8 - 10 years for them to reach mature size; however, they will begin to bear fruit after two to three years and better yields after five years. Blueberries can be propagated in a variety of ways, but softwood or hardwood cuttings are the most common techniques. For home gardeners, a good option is to buy seedlings from a local nursery or garden center. Some common insect pests of blueberries are spotted wing drosophila, Japanese beetles, leaf rollers, and forest tent caterpillars. Also, common diseases include canker, armillaria root rot, and ringspot viruses. Detailed information about growing blueberries can be found in the herb garden section. Blueberry is a deciduous shrubs native to the eastern United States, with branching that extends upright, and it can reach up 6 - 12 feet (1.8 - 3.7 m) tall with an equal width. Blueberry flowers are white to very light pink and bloom in clusters in May. The older stems of the shrub are colored gray-brown with newer ones a yellow-green to reddish color in the winter. Blueberry (Vaccinium corymbosum) is a member of the Ericaceae or heath family, which comprises over 100 genera and more than 3,000 species worldwide. This large group is composed by woody shrubs with dark green leaves, bell shaped flowers and multi-seeded berries. The genus Vaccinium is represented by over 400 species, including bilberry (Vaccinium myrtillus), Cranberry (Vaccinium oxycoccos), hucklberry (Vaccinium membranaceum), and lingonberry (Vaccinium vitis-idaea). Many cultivars of blueberries have been selected based on their growth habits and fruit traits. Some of the more common cultivars in North America include the 'Bluecrop', 'Blueray', 'Jersey', 'North Blue', 'Sunshine Blue', 'Rubel', and 'Patriot'. Before the blueberry boom happened, Native Americans used these dynamic berries for medicinal purposes and natural flavoring. It wasn't until the early 1900's when the American botanist Frederick Coville partnered with Elizabeth White, a recognized authority on native plants from New Jersey, to grow the first successful field of blueberries. In 1916, the blueberries began their journey to the table, when the highbush species was first sold. Blueberries continue to be celebrated as a cultural phenomenon, with July named as National Blueberry Month by the USDA in 1974. The research on blueberries' antioxidants began in the 1990's and continues to this day. The United States continues to be the world's largest producer of blueberries, in which 14 states produce the antioxidant-rich berries. In 2014, the United States produced and used 563.2 million pounds (255.5 million kg) of cultivated blueberries and exported 79 million pounds (36 million kg) of the fresh fruit to Canada, Japan, and other countries. The United States is also a net importer of blueberries, a large majority of which comes from Chile during the winter, while Canada provides almost a fifth of the fresh blueberries coming into the U.S. as well. Gardening. Blueberry shrubs are also used as ornamental plants for hedge borders and wind blocks. Cosmetics. Due to blueberries' antioxidant characteristics, their use in personal care products has begun to increase. Blueberries can now be seen as an ingredient in face masks, scrubs, shampoos, and creams. MRI tests. Health providers have also used this liquid for MRI imaging as an oral contrast agent due to its high manganese concentration. Overall, blueberries provide consumers a myriad of vitamins and minerals that assist with bodily functions. They can be prepared and consumed in many ways, or even used for medicinal purposes. For anyone in the pursuit of healthier options, it may be wise to consider growing or purchasing blueberry products as a viable option toward living a healthier lifestyle.